Always park in well lit areas if possible. Lock it when you leave it (room or vehicle). If you can't take it, hide or cover it (including power cords). UNC Charlotte P&PS permanently engraves unique ID #s to personal items upon request. Do you see anyone loitering? The UNC Charlotte Police Department sponsors Operation ID, a program instituted to prevent larcenies and assist law enforcement officials with stolen property identification. UNC Charlotte P&PS can permanently engrave unique identification numbers onto personal items upon request and serial records are maintained at the Department. Operation ID events are held throughout the year during special functions and at the request of the community. Lojack assists officers in locating stolen vehicles, motorcycles and laptops. A third party company will track stolen items and alert the appropriate law enforcement agencies for a small fee. 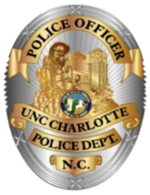 The UNC Charlotte Police Department has recovered several stolen laptops and vehicles with the aid of this system, and students, faculty and staff are encouraged to consider Lojack services to protect their valuables. The Gotcha program is a collaboration between the Police Department and Housing and Residence Life (HRL) focusing on the importance of securing dorm rooms and vehicles. Police and HRL representatives look for dorm rooms and vehicles left unsecured and unattended and then proceed to lock them. This program is conducted in UNC Charlotte residence halls and parking lots.